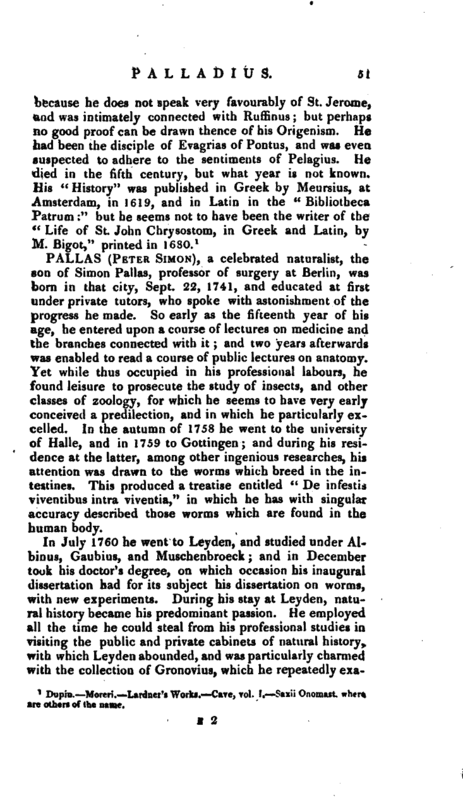 , a celebrated naturalist, the son of Simon Pallas, professor of surgery at Berlin, was born in that city, Sept. 22, 1741, and educated at first under private tutors, who spoke with astonishment of the progress he made. So early as the fifteenth year of his age, he entered upon a course of lectures on medicine and the branches connected with it; and two years afterwards was enabled to read a course of public lectures on anatomy. Yet while thus occupied in his professional labours, he found leisure to prosecute the study of insects, and other classes of zoology, for which he seems to have very early conceived a predilection, and in which he particularly excelled. In the autumn of 1758 he went to the university of Halle, and in 1759 to Gottingen; and during his residence at the latter, among other ingenious researches, his attention was drawn to the worms which breed in the intestines. This produced a treatise entitled “De infestis viventibus intra viventia,” in which he has with singular accuracy described those worms which are found in the human body. In July 1760 he went to Leyden, and studied under Albinus, Gaubius, and Muschenbroeck; and in December touk his doctor’s degree, on which occasion his inaugural dissertation had for its subject his dissertation on worms, with new experiments. During his stay at Leyden, natural history became his predominant passion. He employed all the time he could steal from his professional studies in visiting the public and private cabinets of natural history, with which Leyden abounded, and was particularly charmed with the collection of Gronovius, which he repeatedly | examined. Having visited the principal cities of Holland, her arrived at London, in July 1761. The principal intention of his journey to England was to improve his knowledge in medicine and surgery, and to inspect the hospitals. He was now, however, so much absorbed in his passion for natural history, that he neglected every other pursuit, and gave himself totally up to this favourite branch of science. At this juncture, his zeal was so ardent, that after having passed the day in curiously examining the various collections in natural history, and perusing the principal books he could procure on that subject, he would frequently employ the greater part of the night, and occasionally even whole nights together, whenever he met with new publications that either awakened his curiosity or interested his researches. With a view of extending his information in this department, he took several journeys to the sea-coasts, and particularly in Sussex. Being at length summoned by his father to return to Berlin, he quitted London with regret in the latter end of April 1762, and repaired to Harwich in order to embark for Holland. Being there fortunately detained some days by contrary winds, he embraced that opportunity of examining the sea-coast, and collecting a variety of marine productions. On the 13th of May he landed in Holland, and passing through the Hague, Leyden, and Amsterdam, he continued his route through the Circle of Westphalia, and arrived at Berlin on the 12th of June. 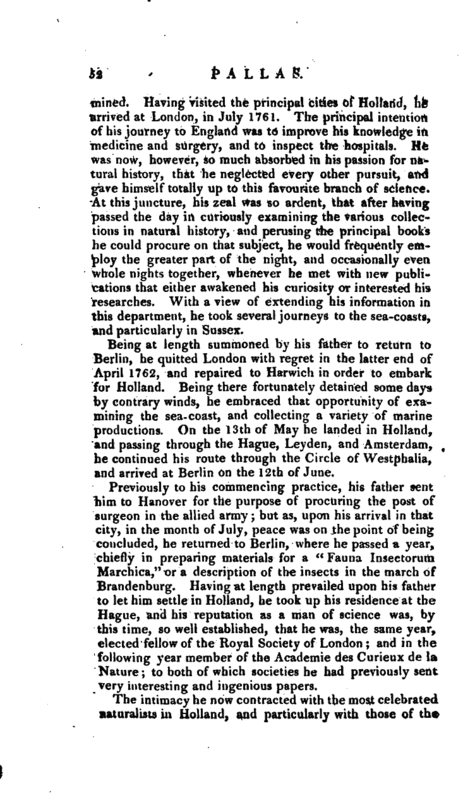 Previously to his commencing practice, his father sent him to Hanover for the purpose of procuring the post of surgeon in the allied army; but as, upon his arrival in that city, in the month of July, peace was on the point of being concluded, he returned to Berlin, where he passed a year, chiefly in preparing materials for a “Fauna Insectorum Marchica,” or a description of the insects in the march of Brandenburg. Having at length prevailed upon his father to let him settle in Holland, he took up his residence at the Hague, and his reputation as a man of science was, by this time, so well established, that he was, the same year, elected fellow of the Royal Society of London; and in the following year member of the Academic des Curieux de la Nature; to both of which societies he had previously sent very interesting and ingenious papers. The intimacy he now contracted with the most celebrated naturalists in Holland, and particularly with those of the | Hague, who had just begun to form a literary society the free access which he had to the museum of the prince of Orange, and other curious cabinets; the systematic catalogues of those collections that he drew up, and several of which he gave to the public; contributed to advance his knowledge of the productions of nature in the various parts of the globe, and enabled him to collect such materials as gave birth to those accurate compositions on zoology, which have deservedly distinguished him as the first zoologist of Europe. One of his earliest works in this branch of science, which rendered him eminently conspicuous, was his “Elenchus- Zoophytorum.” In a dedication prefixed to his “Miscellanea Zoologica,” published in the same year, the author lays before the prince of Orange a plan for a voyage to the Cape of Good Hope, and to the other Dutch settlements in the East Indies, and which, impelled by his wonted ardour for scientific knowledge, he offered to undertake and superintend. This project was strongly recommended by Gaubius, and approved by the prince; but was prevented from being carried into execution by the author’s father; who not only refused his consent to his taking such a distant expedition, but even recalled him to Berlin: in obedience to his father’s wishes, but with great reluctance, he quitted Holland in November 1766. 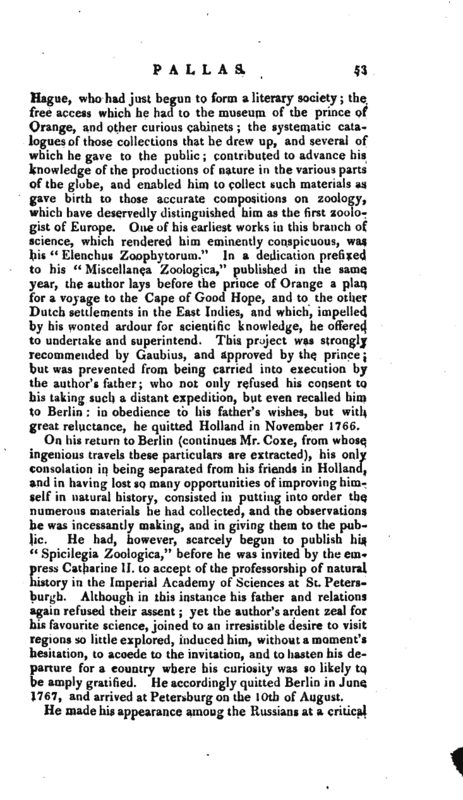 On his return to Berlin (continues Mr. Coxe, from whose ingenious travels these particulars are extracted), his only consolation in being separated from his friends in Holland, and in having lost so many opportunities of improving himself in natural history, consisted in putting into order the numerous materials he had collected, and the observations he was incessantly making, and in giving them to the public. He had, however, scarcely begun to publish his­“Spicilegia Zoologica,” before he was invited by the empress Catharine II. to accept of the professorship of natural history in the Imperial Academy of Sciences at St. Petersburgh. Although in this instance his father and relations again refused their assent; yet the author’s ardent zeal for his favourite science, joined to an irresistible desire to visit regions so little explored, induced him, without a moment’s hesitation, to accede to the invitation, and to hasten his departure for a country where his curiosity was so likely to be amply gratified. He accordingly quitted Berlin in June 1767, and arrived at Petersburg on the 10th of August. He made his appearance among the Russians at a critical | period. The empress had already ordered the Academy of Sciences to send astronomers into various parts of the Russian empire, to observe the transit of Venus over the sun’s disk in 1769. Being just returned from a voyage down the Volga, and from visiting the interior provinces of European Russia, she had perceived the deficiencies of the topographical and geographical accounts, and anticipated the advantage of deputing learned and skilful men to visit the distant provinces of her extensive dominions. For this purpose Catharine had directed the academy to send, in company with the astronomers, the most able naturalists and philosophers. Pallas instantly offered to accompany this expedition; and was as eagerly accepted. He was immediately charged with drawing out general instructions for the naturalists, and was gratified with the choice of his associates. 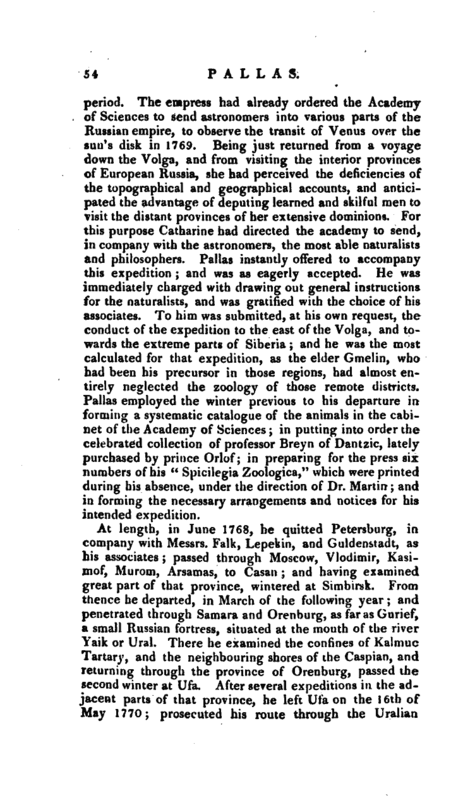 To him was submitted, at his own request, the conduct of the expedition to the east of the Volga, and towards the extreme parts of Siberia; and he was the most calculated for that expedition, as the elder Gmelin, who had been his precursor in those regions, had almost entirely neglected the zoology of those remote districts. Pallas employed the winter previous to his departure in forming a systematic catalogue of the animals in the cabinet of the Academy of Sciences; in putting into order the celebrated collection of professor Breyn of Dantzic, lately purchased by prince Orlof; in preparing for the press six numbers of his “Spicilegia Zoologica,” which were printed during his absence, under the direction of Dr. Martin; and in forming the necessary arrangements and notices for his intended expedition. At length, in June 1768, he quitted Petersburg, in company with Messrs. Falk, Lepekin, and Guldenstadt, as his associates; passed through Moscow, Vlodimir, Kasimof, Murom, Arsamas, to Casan; and having examined great part of that province, wintered at Simbirsk. From thence he departed, in March of the following year; and penetrated through Samara and Orenburg, as far as Gurief, a small Russian fortress, situated at the mouth of the river Yaik or Ural. There he examined the confines of Kalmuc Tartary, and the neighbouring shores of the Caspian, and returning through the province of Orenburg, passed the second winter at Ufa. After several expeditions in the adjacent parts of that province, he left Ufa on the I 6th of May 1770; prosecuted his route through the Uralian | mountains to Catharinenburgh; visited the mines of that district; proceeded to Tcheliabinsk, a small fortress in the government of Orenburg; and in December made an excursion as far as Tobolsk. The next year he was employed in traversing the Altai mountains, and in tracing the course of the Irtish up to Omsk and Koly van; where having inspected the celebrated silver mines, he made for Tomsk, and finished that year’s expedition at Krasnoyarsk, a town upon the Yenisei. In that place, situated only in 56 north latitude, the cold was so intense, that the learned professor was witness to the natural freezing of quicksilver; which curious phenomenon he has minutely described. From Krasnoyarsk he issued on the 7th of March, 177-2; and proceeded by Irkutsk, and across the lake Baikal, to Udinsk, Selenginsk, and Kiakta, where the trade between Russia and China is principally carried on. Having penetrated into that part of Dauria which is situated in the south-easternmost part of Siberia, he journeyed between the rivers Ingoda and Argoon, at no great distance from the Amoor; thence tracing the lines which separate the Kussian empire from the Mongui hordes dependent upon China, he returned to Selenginsk, and again wintered at Krasnoyarsk. In the summer of 1773 he visited Tara, Y r aitsk, and Astracan, and concluded his route for that year at Tzaritzin, a town upon the Volga; from whence he continued his journey in the ensuing spring; and arrived at Petersburg on the 30th of July, 1774, after an absence of six years. 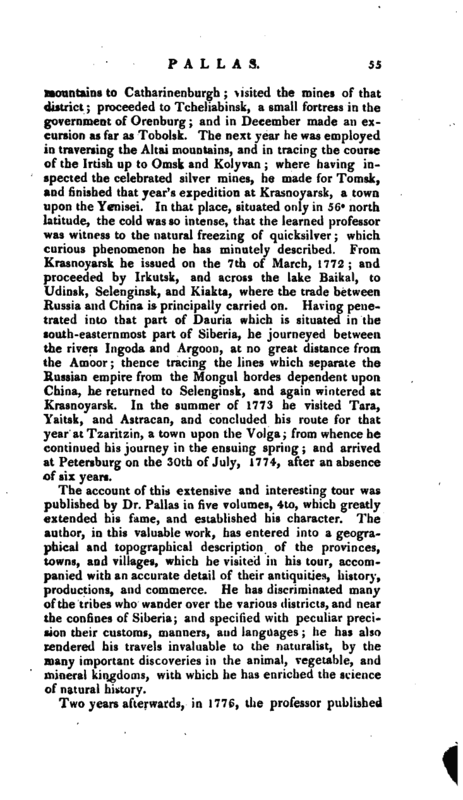 The account of this extensive and interesting tour was published by Dr. Pallas in five volumes, 4to, which greatly extended his fame, and established his character. The author, in this valuable work, has entered into a geographical and topographical description of the provinces, towns, and villages, which he visited in his tour, accompanied with an accurate detail of their antiquities, history, productions, and commerce. He has discriminated many of the tribes who wander over the various districts, and near the confines of Siberia; and specified with peculiar precision their customs, manners, and languages; he has also rendered his travels invaluable to the naturalist, by the many important discoveries in the animal, vegetable, and mineral kingdoms, with which he has enriched the science of natural history. 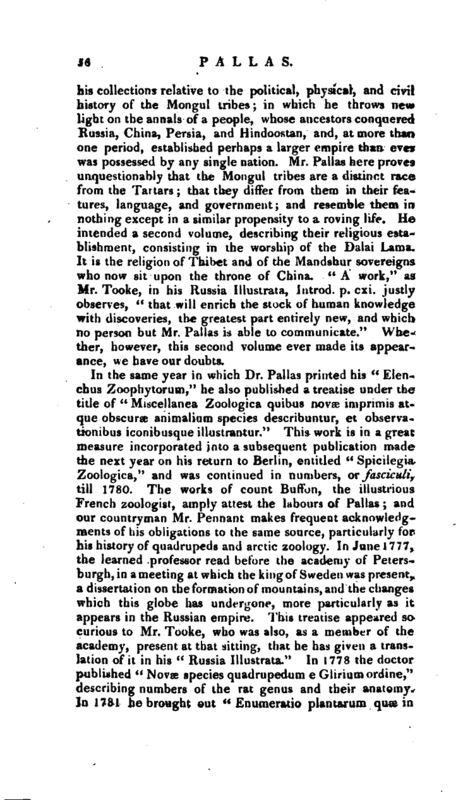 Two years afterwards, in 1776, the professor published | his collections relative to the political, physical, and civil history of the Mongul tribes; in which he throws new light on the annals of a people, whose ancestors conquered Russia, China, Persia, and Hindoostan, and, at more than one period, established perhaps a larger empire than ever was possessed by any single nation. Mr. Pallas here proves unquestionably that the Mongul tribes are a distinct race from the Tartars; that they differ from them in their features, language, and government; and resemble them in nothing except in a similar propensity to a roving life. He intended a second volume, describing their religious establishment, consisting in the worship of the Dalai Lama. It is the religion of Thibet and of the Mandshur sovereigns who now sit upon the throne of China. “A work,” as Mr. Tooke, in his Russia Illustrata, Introd. p. cxi. justly observes, " that will enrich the stock of human knowledge with discoveries, the greatest part entirely new, and which no person but Mr. Pallas is able to communicate. 1 * Whether, however, this second volume ever made its appearance, we have our doubts. In the same year in which Dr. Pallas printed his “Elenchus Zoophytorum,” he also published a treatise under the title of “Miscellanea Zoologica quibus novae imprimis atque obscurae animalium species describuntur, et observationibus iconibusque illustrantur.” This work is in a great measure incorporated into a subsequent publication made the next year on his return to Berlin, entitled “Spicilegia Zoologica,” and was continued in numbers, or fasciculi, till 1780. The works of count Buffon, the illustrious French zoologist, amply attest the labours of Pallas; and our countryman Mr. Pennant makes frequent acknowledgments of his obligations to the same source, particularly for his history of quadrupeds and arctic zoology. In June 1777, the learned professor read before the academy of Peters* burgh, in a meeting at which the king of Sweden was present, a dissertation on the formation of mountains, and the changes which this globe has undergone, more particularly as it appears in the Russian empire. This treatise appeared so curious to Mr. Tooke, who was also, as a member of the academy, present at that sitting, that he has given 3 translation of it in his “Russia Illustrata.” In 1778 the doctor published “Novae species quadrupedum e Gliriumordine,” describing numbers of the rat genus and their anatomy. In 1781 he brought out “Enumeratio plantarum quae in | horto Procopii & Demidof Moscua vigent,” or catalogue of the plants in M Demidofs gardens at Moscow. His newnorthern collections on various subjects in geography, natural history, and agriculture, came forth the same year; to which were afterwards added two more volumes. 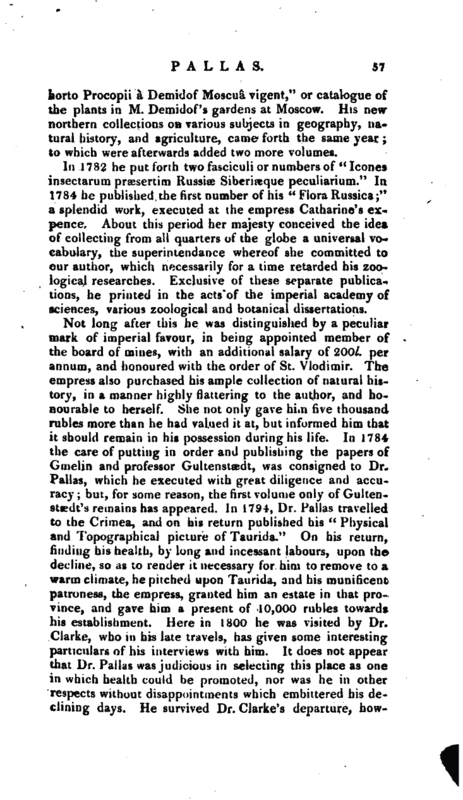 In 1782 he put forth two fasciculi or numbers of * Icones insectarum prsesertim Russiae Siberieeque peculiarium.“In 1784 he published the first number of his” Flora Russica;" a splendid work, executed at the empress Catharine’s expence. About this period her majesty conceived the idea of collecting from all quarters of the globe a universal vocabulary, the superintendance whereof she committed to our author, which necessarily for a time retarded his zoological researches. Exclusive of these separate publications, he printed in the acts of the imperial academy of sciences, various zoological and botanical dissertations. 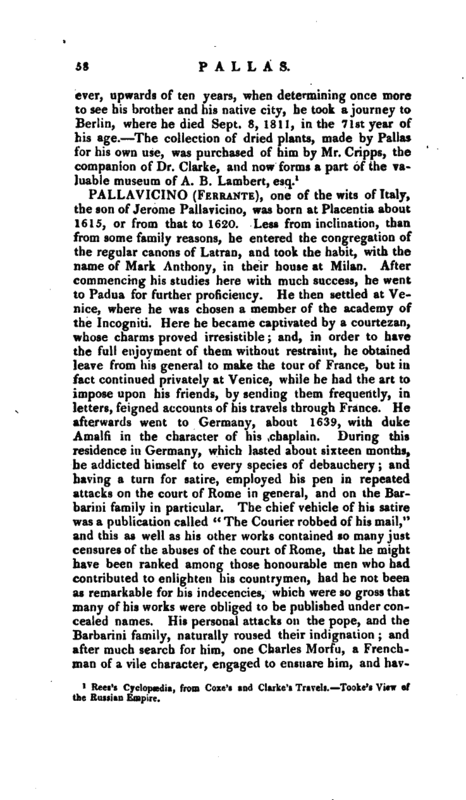 Rees’s Cyclopædia, from Coxe’s and Clarke’s Travels. Tooke’s View of the Russian Empire.